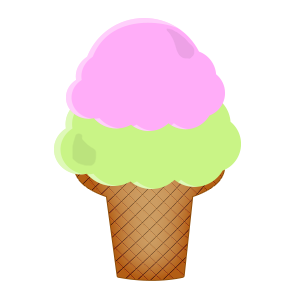 9/18/15 – The Scoop #5 – Awesome DLC announcement! Howdy folks! The Weekly Post has been renamed to The Scoop since we decided to change it up to every other Friday instead of every week. This way we can give you more info as you just never know what’s going to come up each week. Last week, our Update v5.6 was all about getting things cleaned up in game, so you should have noticed various optimizations, things generally running smoother & faster, and a revamped contextual menu. The UI is a tricky one because we have SO many options, and you guys keep wanting more, so the contextual menu was getting more and more cluttered. We’ve discussed in the past how we can improve it going through various types of menu styles and we’ve finally found one that works for us and will also allow us to expand on it should we (gasp) add even more features! A new feature we added in was the Vector Tool. This thing is great, because it allows you to draw smooth lines AND you can also draw on locked objects. So those of you who wanted to draw on boards or tokens and what not, now you can! The Vector Tool IS in beta though, so there will be a lot of improvements to it. Unfortunately you can’t erase or have the lines stick to your locked objects should you move them around, but don’t worry those are improvements that will be fixed up in the future. 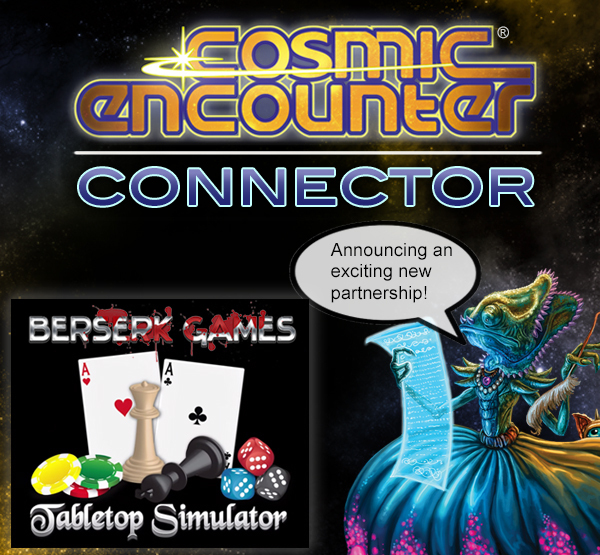 Today we are excited to announce that Berserk Games and Future Pastimes have partnered up to bring the Cosmic Encounter® Connector to life as Tabletop Simulator’s next official DLC! Cosmic Encounter is a game of interplanetary colonization and cunning negotiations for three to five players. Each player takes on the role of the leader of a unique alien race seeking to colonize as many planets as possible away from your native system. The first alien race (or races) to colonize five planets in other players’ systems wins. Of course, even planets that are not yet colonized are still defended, and in order to establish a settlement, you’ll need to win over the alien race that controls that planet—through negotiation, partnership, or war. The core set includes fifty alien races, each with its own history and powers. You may be the leader of the genteel and thieving Filches, sensitive and oozing Amoebas, sneaky, infesting Parasites, or self-sacrificing Kamikazes. Your powers may enable you to quickly travel through space, prevent your defeated ships from falling into the Warp, or allow you to look at another player’s hand before you decide your next move. Each alien has individual strategic tools and a specific play style that shapes all of its encounters—and in fact, the entire game. You begin with five home planets and twenty ships. A hyperspace gate opens before you, and in the heart of the galaxy is the Warp, which marks both success and failure. If your race establishes a new colony, your marker advances on the Warp counter. When you fail to do, the ships involved in that encounter are sent into the abyss of the Warp. Destiny decides the location of every attempted colony. It may be in the system of a dire foe or long-term ally. Once you’ve launched your ships, you can then ask other players to support you, as can your opponent. But be careful! Even your allies are still enemy alien races with their own agendas. Will their participation mean that they advance, while you struggle behind? Or are you cunning enough to use the alliance for your own benefit? When all the ships have reached their destination, you pick what card you will play, deciding whether to fight, negotiate, or morph and mimic whatever your opponent does. Alien powers and Reinforcement, Artifact, and Flare cards can also be played at this time to affect the outcome of the encounter. Finally, you and your opponent resolve the outcome. Your may win and get to establish the colony you wanted. You may be defeated and your ships sent into the Warp until you rescue them during another turn. You may win a battle and still lose ships or cards, you may gain more through negotiation than you would have through fighting, or negotiations may fail utterly with dire consequences for both parties. Cosmic Encounter offers you and your fellow aliens several variants for gameplay. Should you desire, a game can be shortened or lengthened by requiring fewer or more colonies. Tech cards can be integrated, which give each player a specific objective. Once accomplished, the Tech card becomes a useful asset that you can use later in the game. Players could also choose to conceal their alien powers until the moment they are used, or rotate which alien races they control and become a new alien every round. With its numerous alien races, Flare cards, Artifact cards, and gameplay variants, Cosmic Encounter truly offers an infinity of gaming experiences. It is easy-to-learn for younger or less experienced players, but has enough variety and strategic complexity to engross even the most experienced board gamers. Amass your fleet, form your alliances, and dive into the vast galaxy of this classic game! DLC – Besides Cosmic Encounter that’s coming soon, we have 2 other confirmed DLCs that will be announced in the near future! Improvements to the Vector tool, Auto Raise, and Grid snapping.